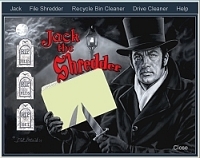 Jack the Shredder - File Shredder, Recycle Bin Shredder, and Free-space shredder. An easy-to-use file shredder with unique features. Includes free 'Chief Inspector' program that actually shows you that your 'deleted' files often still exist, and that you need 'Jack the Shredder' to permanently destroy them. Choose from ten different shredding algorithms, many based on official government shredding standards, with up to 100 passes selectable for each. Set up Preset folders to be shredded and file types to be excluded. Drag and Drop files and folders onto 'Jack' to shred them. Or right-click on any file or folder on your computer and choose 'Shred' from the pop-up menu. Recycle Bin File Eradicator. Complete Drive Cleaner function (aka free-space shredding). Special Safety Mode to guard against accidental shredding. Generate a report log of files shredded. Toggle sound effects and scary messages on and off to warn you before shredding. Password Protection to restrict access from unauthorized users. CNGeoip - Allows you to identify visitors' cities and countries by their IP's. BackupXpress Pro - BackupXpress is your professional file backup software. You can use it to compress files to an archive or copy them to different places in a network or workgroup. MSI to EXE Setup Converter - Convert Microsoft installer files (.msi) into .exe files with the help of MSI to EXE converter. Software can create EXE file from your MSI setup files so that you can perform a fast installation of your application with any windows OS. OutlookFix - Outlook repair software will fix Outlook files and restore data that cannot be accessed as well as deleted data. Repair all Outlook email, attachments and elements in Outlook. EaSynth JRepacker - A freeware that provides the facility to repack your java application and the JRE, in order to reduce the size of the stand alone delivery. BootIt Next Generation - A partition and multi boot manager with a powerful and simple to use set of tools to quickly partition, image, or multi boot your computer.